We provided a St. Louis-based Financial Firm with a kitchen odor elimination system. The solution for the system consisted of two Blue Ox OX1100 units. The system pushes air in a circular pattern around the kitchen and dining areas. This helps them to eliminate the cooking smells and prevents the smells from escaping into the adjoining office areas. The Firm was so pleased with the two OX1100 units, they invited us to come take a look and document the installation and effectiveness of the system ourselves! We purchased the Tinder Box in Rapid City, SD. Upon entering into the lease we knew we had to do something with the smoke. Our experience at the Tinder Box as guests prior to our purchase was terrible. It was a blue haze, with only 4 cigars fired up. We installed 4 units and they work beautifully. The difference is amazing! The "regulars" that had experienced the same "blue haze" were amazed what Blue Ox was doing for us. We have new guests that come in daily and stay because of the comfort of clean air. SCCM specializes in machining all types of materials including plastics, steels and nonferrous metals. Their equipment includes CNC Machines, Abrasive Water Jet Machines, Heat Treatment, Welding, Black Oxide, Wire EDM and a vast array of Manual Machining Tools. Four OX3500C's (with silencers) were installed above the shop floor. They were positioned to create an airflow pattern which encompassed all of the machines in the shop. With this configuration, particles in the air were reduced dramatically and conditions in the shop greatly improved. Olde Dog Woodworking is a small home-based woodshop that focuses on fine custom residential installations. Scott specializes in fireplace mantles, custom cabinetry, bars, bookshelves and high-end specialty built-ins of all kinds. Since the space is small, a strategically placed OX1100 unit was enough to generate a sufficient air pattern. The addition of a secondary system has dramatically reduced the amount of airborne particles and eliminated the spread of wood dust into the living space leading to better air quality. Mac Fasteners is a leading manufacturer of aerospace fasteners, which services the entire aerospace and defense industries. Their facility has multiple large Smog-Hog electrostatic oil mist collectors, but they are insufficient to handle the large volume of evaporated coolant. Blue Ox provided 8 OX3500C units with oil collection assemblies. Because these units are more cost effective, we provided more units, resulting in more air changes per hour and better results. Weber Made is a small printing company in St. Louis. They needed to remove harmful printing solvents from the air in their small print shop. With such a small work area they needed a solution that was unintrusive, cost efficient, and didn't require a complicated installation or construction. 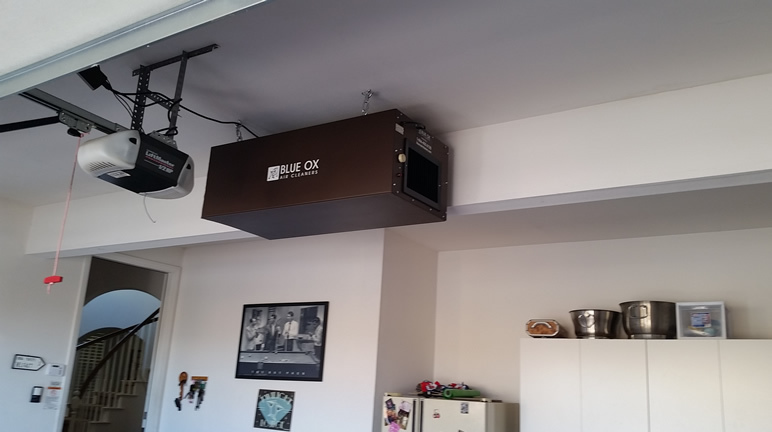 Blue Ox provided one OX1100-CC unit, which was hung in the shop above the printer. The one unit alone is powerful enough to remove the harmful printing solvents from the air. Granite Transformations is a global, full service home and business remodeling system that offers a wide selection of resurfacing designs in a number of beautiful materials. There manufacturing facility was having issues with granite and silica particles in the air and epoxy odors. We installed one OX3000 unit in the shop above the main work area to reduce the epoxy odors and remove granite and silica dust particles from the air. A small local welding shop was having an issue ventilating welding fumes from his shop. The fumes would get so bad at times that it would create a thick fog in the air. Prolonged exposure to welding fumes may cause serious health problems. We installed one OX3000 over the main work area. This has greatly reduced harmful welding fumes from the air and also it has created air circulation throught the workarea. 33 Roadhouse is a small bar in Crosby, MS. The bar was having an issue with tobacco smoke filling the air. This created a haze in the air and the smoke was impacting the air quality in the bar. 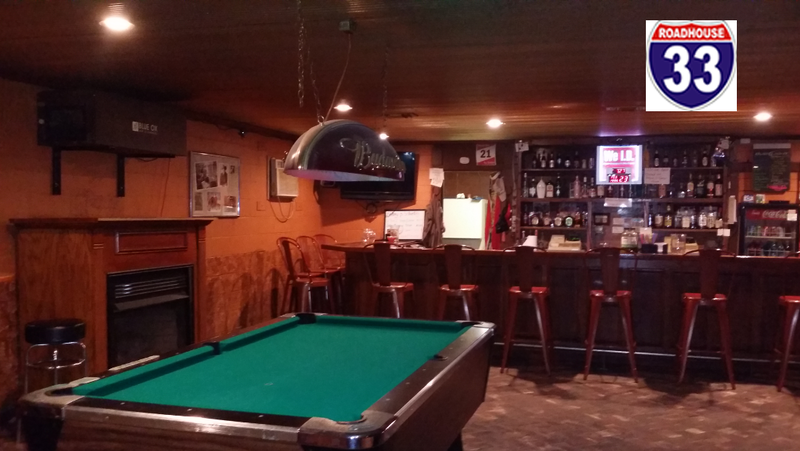 The owners of 33 Roadhouse wanted a cost-efficient solution that wouldn't be too noisey. They also wanted a solution that wouldn't take up too much space or cause a distraction to patrons. We installed one OX 1100 Unit above the fireplace along the far wall.The one unit is powerful enough to remove the haze from the air and greatly improve the overall air quality. A family recently contacted us for help with tobacco smoke. Whenever they had friends & family over, the garage / man cave was also the designated smoking area. This was causing smoke residue on the ceilings & a smokey odor in the air. They wanted a quiet & cost-efficient solution to help remove the odors & particulate from the air. We installed one OX 1100 Unit in the center of the back wall of the garage. The one unit is powerful enough to remove the odor from the air & greatly improve the overall air quality. AIS is a heavy equipment dealership for John Deere and Komatsu equipment. We have anywhere from 3-6 guys working in this department fabricating attachments for equipment or modifying/repairing equipment for customers. The primary problem was during the plasma cutting operation the shop would get really hazy and would stay that way for up to an hour after cutting. They were also having issues with smoke filling the shop during the welding process.